In mathematics, topology (from the Greek τόπος, place, and λόγος, study) is concerned with the properties of space that are preserved under continuous deformations, such as stretching, twisting, crumpling and bending, but not tearing or gluing. An n-dimensional topological space is a space (not necessarily Euclidean) with certain properties of connectedness and compactness. The space may be continuous (like all points on a rubber sheet), or discrete (like the set of integers). It can be open (like the set of points inside a circle) or closed (like the set of points inside a circle, together with the points on the circle). Topology, as a well-defined mathematical discipline, originates in the early part of the twentieth century, but some isolated results can be traced back several centuries. Among these are certain questions in geometry investigated by Leonhard Euler. His 1736 paper on the Seven Bridges of Königsberg is regarded as one of the first practical applications of topology. On 14 November 1750, Euler wrote to a friend that he had realised the importance of the edges of a polyhedron. This led to his polyhedron formula, V − E + F = 2 (where V, E, and F respectively indicate the number of vertices, edges, and faces of the polyhedron). Some authorities regard this analysis as the first theorem, signalling the birth of topology. Their work was corrected, consolidated and greatly extended by Henri Poincaré. In 1895, he published his ground-breaking paper on Analysis Situs, which introduced the concepts now known as homotopy and homology, which are now considered part of algebraic topology. Topology can be formally defined as "the study of qualitative properties of certain objects (called topological spaces) that are invariant under a certain kind of transformation (called a continuous map), especially those properties that are invariant under a certain kind of invertible transformation (called homeomorphisms)." Topology is also used to refer to a structure imposed upon a set X, a structure that essentially characterizes the set X as a topological space by taking proper care of properties such as convergence, connectedness and continuity, upon transformation. 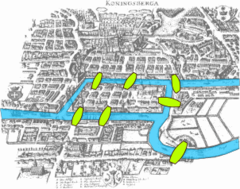 In one of the first papers in topology, Leonhard Euler demonstrated that it was impossible to find a route through the town of Königsberg (now Kaliningrad) that would cross each of its seven bridges exactly once. This result did not depend on the lengths of the bridges or on their distance from one another, but only on connectivity properties: which bridges connect to which islands or riverbanks. This Seven Bridges of Königsberg problem led to the branch of mathematics known as graph theory. An introductory exercise is to classify the uppercase letters of the English alphabet according to homeomorphism and homotopy equivalence. The result depends on the font used, and on whether the strokes making up the letters have some thickness or are ideal curves with no thickness. The figures here use the sans-serif Myriad font and are assumed to consist of ideal curves without thickness. Homotopy equivalence is a coarser relationship than homeomorphism; a homotopy equivalence class can contain several homeomorphism classes. The simple case of homotopy equivalence described above can be used here to show two letters are homotopy equivalent. For example, O fits inside P and the tail of the P can be squished to the "hole" part. The term topology also refers to a specific mathematical idea central to the area of mathematics called topology. Informally, a topology tells how elements of a set relate spatially to each other. The same set can have different topologies. For instance, the real line, the complex plane, and the Cantor set can be thought of as the same set with different topologies. The members of τ are called open sets in X. A subset of X is said to be closed if its complement is in τ (i.e., its complement is open). A subset of X may be open, closed, both (a clopen set), or neither. The empty set and X itself are always both closed and open. An open subset of X which contains a point x is called a neighborhood of x. While topological spaces can be extremely varied and exotic, many areas of topology focus on the more familiar class of spaces known as manifolds. A manifold is a topological space that resembles Euclidean space near each point. More precisely, each point of an n-dimensional manifold has a neighborhood that is homeomorphic to the Euclidean space of dimension n. Lines and circles, but not figure eights, are one-dimensional manifolds. Two-dimensional manifolds are also called surfaces, although not all surfaces are manifolds. Examples include the plane, the sphere, and the torus, which can all be realized without self-intersection in three dimensions, and the Klein bottle and real projective plane, which cannot (that is, all their realizations are surfaces that are not manifolds). The basic object of study is topological spaces, which are sets equipped with a topology, that is, a family of subsets, called open sets, which is closed under finite intersections and (finite or infinite) unions. The fundamental concepts of topology, such as continuity, compactness, and connectedness, can be defined in terms of open sets. Intuitively, continuous functions take nearby points to nearby points. Compact sets are those that can be covered by finitely many sets of arbitrarily small size. Connected sets are sets that cannot be divided into two pieces that are far apart. The words nearby, arbitrarily small, and far apart can all be made precise by using open sets. Several topologies can be defined on a given space. Changing a topology consists of changing the collection of open sets, and this changes which functions are continuous, and which subsets are compact or connected. Metric spaces are an important class of topological spaces where distances between any two points are defined by a function called a metric. In a metric space, an open set is a union of open disks, where an open disk of radius r centered at x is the set of the points whose distance to x is less than d. Many common spaces are topological space whose topology can be defined by a metric. This is the case of the real line, the complex plane, real and complex vector spaces and Euclidean spaces. Having a metric simplifies many proofs. Algebraic topology is a branch of mathematics that uses tools from algebra to study topological spaces. The basic goal is to find algebraic invariants that classify topological spaces up to homeomorphism, though usually most classify up to homotopy equivalence. Geometric topology is a branch of topology that primarily focuses on low-dimensional manifolds (i.e. spaces of dimensions 2, 3, and 4) and their interaction with geometry, but it also includes some higher-dimensional topology. Some examples of topics in geometric topology are orientability, handle decompositions, local flatness, crumpling and the planar and higher-dimensional Schönflies theorem. Topology is relevant to physics in areas such as condensed matter physics, quantum field theory and physical cosmology. Although TQFTs were invented by physicists, they are also of mathematical interest, being related to, among other things, knot theory, the theory of four-manifolds in algebraic topology, and to the theory of moduli spaces in algebraic geometry. Donaldson, Jones, Witten, and Kontsevich have all won Fields Medals for work related to topological field theory. The possible positions of a robot can be described by a manifold called configuration space. In the area of motion planning, one finds paths between two points in configuration space. These paths represent a motion of the robot's joints and other parts into the desired pose. ^ "the definition of topology". ^ Bruner, Robert (2000). "What is Topology? A short and idiosyncratic answer". ^ Fréchet, Maurice (1906). Sur quelques points du calcul fonctionnel. PhD dissertation. OCLC 8897542. ^ Allen Hatcher, Algebraic topology. (2002) Cambridge University Press, xii+544 pp. ISBN 0-521-79160-X, 0-521-79540-0. ^ Budney, Ryan (2011). "What is geometric topology?". mathoverflow.net. Retrieved 29 December 2013. ^ Johnstone, Peter T. (1983). "The point of pointless topology". Bulletin of the American Mathematical Society. 8 (1): 41–53. doi:10.1090/s0273-0979-1983-15080-2. ^ Stadler, Bärbel M.R. ; Stadler, Peter F.; Wagner, Günter P.; Fontana, Walter (2001). "The Topology of the Possible: Formal Spaces Underlying Patterns of Evolutionary Change". Journal of Theoretical Biology. 213 (2): 241–274. CiteSeerX 10.1.1.63.7808. doi:10.1006/jtbi.2001.2423. PMID 11894994. ^ a b Gunnar Carlsson (April 2009). "Topology and data" (PDF). Bulletin (New Series) of the American Mathematical Society. 46 (2): 255–308. doi:10.1090/S0273-0979-09-01249-X. ^ "The Nobel Prize in Physics 2016". Nobel Foundation. 4 October 2016. Retrieved 12 October 2016. ^ Stephenson, C.; et., al. (2017). "Topological properties of a self-assembled electrical network via ab initio calculation". Sci. Rep. 7: 41621. Bibcode:2017NatSR...741621S. doi:10.1038/srep41621. PMC 5290745. PMID 28155863. ^ Cambou, Anne Dominique; Narayanan, Menon (2011). "Three-dimensional structure of a sheet crumpled into a ball". Proceedings of the National Academy of Sciences. 108 (36): 14741–14745. arXiv:1203.5826. Bibcode:2011PNAS..10814741C. doi:10.1073/pnas.1019192108. PMC 3169141. PMID 21873249. ^ Yau, S. & Nadis, S.; The Shape of Inner Space, Basic Books, 2010. ^ https://math.stackexchange.com How to reason about disentanglement puzzles. ^ Horak, Mathew (2006). 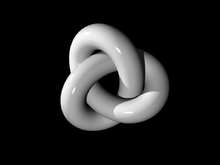 "Disentangling Topological Puzzles by Using Knot Theory". Mathematics Magazine. 79 (5): 368–375. doi:10.2307/27642974. JSTOR 27642974. .
^ http://sma.epfl.ch/Notes.pdf A Topological Puzzle, Inta Bertuccioni, December 2003. ^ https://www.futilitycloset.com/the-figure-8-puzzle The Figure Eight Puzzle, Science and Math, June 2012. Breitenberger, E. (2006). "Johann Benedict Listing". In James, I.M. (ed.). History of Topology. North Holland. ISBN 978-0-444-82375-5. Kelley, John L. (1975). General Topology. Springer-Verlag. ISBN 978-0-387-90125-1.